(Photo: REUTERS / Andrew Medichini / Pool)Pope Francis attends a meeting with refugees and disabled youths in Bethany beyond the Jordan river May 24, 2014. Pope Francis called for urgent steps to end Syria's three-year-old civil war as he arrived in neighboring Jordan on Saturday, starting a Middle East trip aimed at bringing hope to the region's dwindling Christian population. 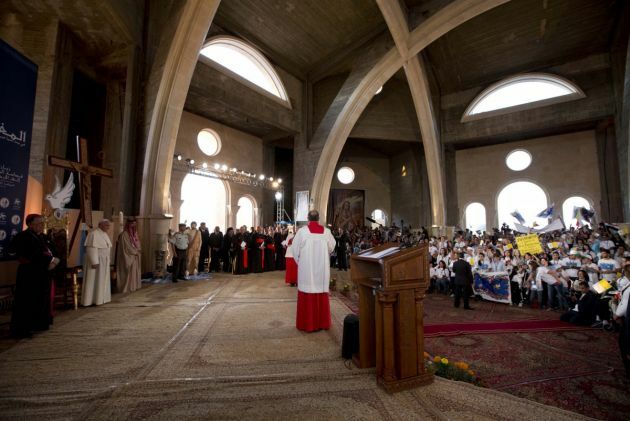 More than 3,000 Iraqi Christians have fled Mosul and the Nineveh Plain and sought refuge in Jordan, as extremists continue to persecute religious minorities in strife-torn Iraq. Rising violence by the Islamic State against Christian and other minorities living in Iraq, has pushed thousands of people into refugee areas, a Latin Church official keeping track of the situation has said. Archbishop Maroun Laham told Fides Catholic news agency on October 20, relief workers caring for refugees are anticipating more people will seek shelter as jihadists drive Christians from the area. Laham, who is the patriarchal vicar for Jordan, said the Christian refugees in the country have arrived at different parishes. Some were housed in Latin parishes, while others took shelter at the parishes of Greek-Catholic, Syrian Catholic and Armenian Christians. Caritas Jordan has continued to support the basic needs of the refugees, while a host of charities and volunteer organizations provide the other necessities of the Christians there, according to Laham. Aside from their basic needs, refugee families also worried about their children's studies. They have explored the possibilities of their children continuing their studies there, as well as university students, who are looking into attending school there. While safety and security remained the paramount concern, Laham lamented the fact that the circumstances of the Christians leaving their homeland risked wiping out the Middle East Christian population. He said some of the refugees had already started looking for another place to settle down. It was clear that returning to Iraq was not an option. "Two traits are shared by the vast majority of Christian refugees: nobody wants to go back to Iraq and everyone is trying to get a visa to Australia or America," Laham said in an interview with Fides. "In this sense, the choices of Western embassies risk in their own way, to heavily contribute to the disappearance of the Christian presence in the Middle East," he noted. "The Chaldean Patriarch has recognized that every Christian must decide according to their conscience what to do." Fighting persisted in some parts of Iraq as extremists from the Islamic State have waged a war against Christians and other religious minorities in the area.